The 21st mantrA in this section is the 93rd mantrA of the invocation. In this mantrA the sage reveals the nature of the state of consciousness that he is established in and in the process he awakens the reader to certain esoteric concepts pertaining to nAdA or sound/harmonics. உருக்கிய ரோமம் ஒளிவிடுந் தானே. 21.5.93. In vain they melt the waxing lustre of His glowing locks.21.5.93. 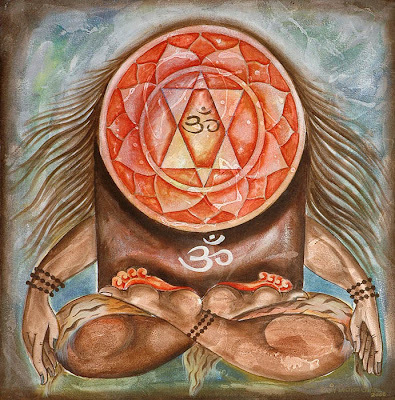 Com - In the countless measures that are in Veda Rig, there exist countless mantrAs in the Rig vEdA In vain they melt waxing lustre of His glowing locks. and all of those countless mantrAs are dissolved (finally) into the subtle (sUkshma) essence known as the pranavA (om). The Sun and Moon with their splendid argent rays, and at the peak of the above said pranavA the Sun and the Moon reveal their respective lustre and light in the form of the Atma jyOthi (self light) He indwells with His radiant locks and in that highly subtle state, there exudes an effulgence of golden light rays. * This mantrA has to be understood in light of sAdhanA involving the ascent of kundalini and gradually lifting the individual into ascending states of intelligence/consciousness. When the sivashaktI normally resident in the mUlAdhArA is focused upwards it will finally culminate in the experience of pranavA (om) and its peak state. The countless mantrAs that are mentioned here as being in the Rig vEdA have to be understood as metaphors for all mantrAs. When looked at separately, these mantrAs are set in various measures (chandas), they are dedicated to various dEvatAs (divinities), have different uses and applications, are articulated differently - there are many differences in them. But in reality all the countless mantrAs that exist in this world are all nAdamayA - i.e. they are finally understandable as nAdA (I dont know whether to use the word sound or harmonic to describe nAdA). The final limit of the realm of nAdA is also the final limit of the pranavA (om). This is because the om is the seed nAdA for all else and all other sound/harmonic is finally absorbed into the pranavA. It is apt to note that the scriptures have unanimously declared that the essence of the vEdAs is the gAyatrI (mantrA) and the essence of gAyatrI is the pranavA (om) and thus the pranavA is the essence of all mantrAs. The stage where the pranava nAdA ends is known as nAdAntA (the end or final limit of nAdA). The seers who have reached this height describe that at this stage, amidst the effulgence of the sOmA (moon) sUryA (sun) and agni (fire) mandalAs, the supreme Atma jyOthI (self effulgence) becomes manifest at the peak of the pranavA. 'a' - is connected to the jAgrat avasthA or the waking state of consciousness. 'u' - is connected to the swapna avasthA or the dream state of consciousness. 'ma' - is connected to the sushupti avasthA or the deep sleep state of consciousness. 'nAdA' - is connected to the turiyA avasthA or the transcendental fourth state of consciousness. 'bindu' - is the turiyAthItha avasthA or the state beyond even the fourth state. I must also note here that the 'a' represents the agni mandalA or the orb of fire, the 'u' represents the sUrya mandalA or the solar orb and the 'ma' represents the sOma mandalA or the lunar orb. The exact location of these spheres in the human etheric body and their bIjAs and constituents need to be learnt from a competent guru. Thus with the above information it becomes clear that the state known as nAdAntA is one which is effectively beyond/transcendent to all the above mentioned five aspects. At this state there is a lack of modulation, or flux in consciousness - there is simply a seamless state of being. Through the above mantrA the sage reveals that he was ever established in this transcendental state of awareness (of nAdAntA) and he sort of describes the 'topography' of such a realm by indicating the atmic effulgence and the state where its perception becomes possible. So we know that the sage is well capable of fulfilling his role in bringing this tamizh marai (the thirumandiram) to the peoples of the world. It is also clear that prior to his descent from kailAs to the southern land, he was established in the abode of sivA as atma jyOthi in the supreme realm beyond the pranavA. Here ends the 93rd mantrA of the invocation in the thirumandiram.